Sometimes, when a baby is born, parents will notice a loud, “squeaky” sound when the baby breathes. Or perhaps the hospital nursery staff notices problems with a baby’s breathing along with noisy breathing, sufficient to keep the baby inpatient until the cause is discovered. Nearly all cases of laryngomalacia are evident by the time the baby is 5 weeks old. Other times, an older child will present with “snoring” and sleep apnea, or loud breathing with exercise, which must be investigated. Parents are often confused and alarmed when they are told their infant or child has a condition known as laryngomalacia (pronounced la-ring-o-mal-asha). This condition is generally congenital, and floppy tissue collapses over the vocal cords to produce the loud, squeaky noise. The noise is known as “stridor,” and occurs when the baby inhales. The stridor of laryngomalacia will often get worse around 4-8 months of age, before slowly resolving. The vast majority of laryngomalacia cases resolve by the time a baby is two years old. Time resolves laryngomalacia in 99% of cases. Laryngomalacia can be a very mild disorder with no complications, or can be extremely severe, requiring surgical intervention. Most babies with laryngomalacia have the mild form of the disorder. A normal voice box (larynx) is on the left. For children with laryngomalacia, the tissue above the vocal cords is floppy, collapsing inward when the child tries to breathe. This creates noisy breathing, and sometimes causes serious complications. A pH probe may be performed if laryngomalacia is complicated by acid reflux. This involves a small pH-detecting probe inserted through the nose, which is worn for 24 hours. Observation: squeaky stridor when the baby inhales. Generally, a baby will be referred to an Ear, Nose, and Throat doctor when stridor is detected by a pediatrician. Flexible Laryngoscopy: A small, flexible probe is threaded up the baby’s nose and into his or her throat to visualize the vocal cords. This test is performed while the baby or child is awake, and parents may be asked to feed the child during the test if there is a history of choking or aspirating on liquids. While the procedure can be upsetting for children, it is not painful. The probe is usually about the size of a spaghetti noodle. Parents are often able to see the camera images from the probe on a video screen during the procedure. Microlaryngoscopy/bronchoscopy: visualization of the entire airway while child is asleep. This test is done in the hospital under anesthesia. X-rays: sometimes X-rays will be ordered of the neck and chest region to make sure there is no other anatomical problem as the cause for the stridor. pH/Impedance Probe: Many children with laryngomalacia also have GERD. If acid reflux is suspected, a pH probe may be performed to determine the severity of the reflux. The traditional pH probe is placed by a GI Specialist and proper placement in the lower esophagus is determined by X-ray. Another type of pH probe is known as the pharyngeal pH probe (or “airway probe”), which detects reflux reaching the upper airway and nasal regions. This pH probe is often placed by an ENT and sits just behind the uvula (the dangling bit at the back of the mouth). Upper Endoscopy: This test is usually performed by a GI doctor if acid reflux is suspected. The esophagus will be evaluated, and often a sample of tissue will be sent for biopsy to determine if there is any damage caused by the acid reflux. Sleep Study: Sometimes a sleep study will be ordered to determine if there are apneas (cessation of breathing) when the child sleeps. The most common symptom of laryngomalacia is noisy breathing (stridor), particularly when the baby is crying, agitated, or lying on his/her back. GERD: It is possible that acid reflux may cause laryngomalacia. Some researchers think that the constant exposure of acid to the delicate tissues of the throat creates swelling and weakness in the larynx. On the other hand, other researchers feel that the laryngomalacia creates a suction effect, which causes the acid reflux. This is referred to as a “chicken or egg” problem, since so many children have both laryngomalacia and GERD. Many children have laryngomalacia and acid reflux. The acid reflux may be obvious due to frequent vomiting, or may be “silent reflux,” in which the child does not vomit. Silent reflux is quite insidious, as the acid often reaches the very delicate and unprotected tissues of the nose and airway. Children with silent reflux may sometimes choke, cough, gag, have asthma, recurrent pneumonia, frequent ear infections, and frequent sinus infections. Failure-to-thrive: Some children have severe laryngomalacia, and the effort to breathe requires more calories than the child can take in. In this case, the child cannot grow or maintain appropriate weight. Sleep Apneas: Some children may breathe well during the day, but have apneas when the airway relaxes during sleep. Sleep apnea can cause a great deal of growth and developmental problems in young children, so this problem must be treated. 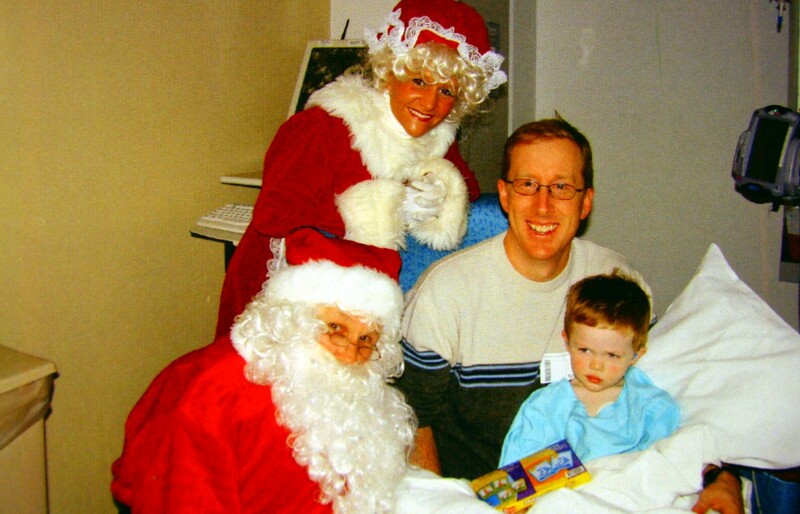 Recovering from a supraglottoplasty: Santa Claus visits the Pediatric Intensive Care Unit. For some children with severe laryngomalacia, a surgery called a supraglottoplasty will be recommended. For the majority of children, this surgery will eliminate the apnea, though some stridor may remain. The techniques vary, but the child will be placed into a pediatric intensive care unit after surgery. Many children will require intubation of the airway after surgery, to prevent the airway from swelling shut. 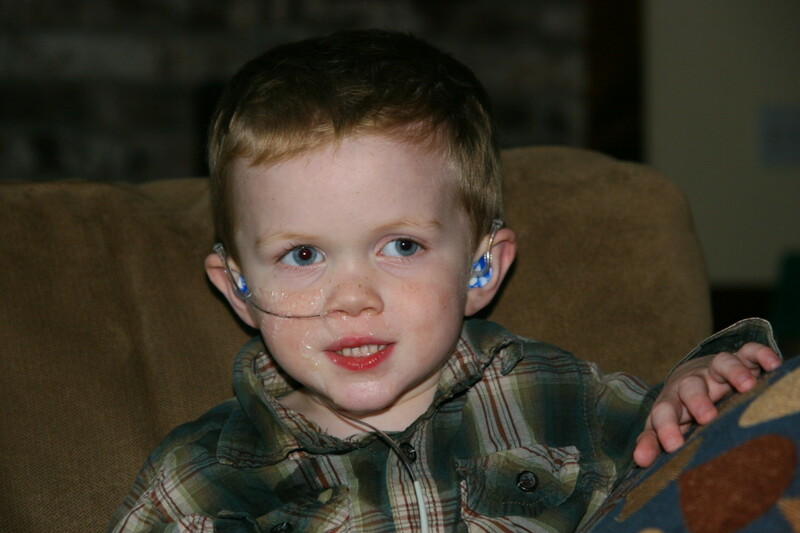 Some children do not experience swelling after surgery and the airway tube is removed in the recovery room. Children with uncontrolled acid reflux may see a recurrence in the laryngomalacia due to chronic acid exposure and swelling of the tissue in the larynx. Acid reflux should be completely suppressed before committing to surgery. Surgeons are extremely careful to take the smallest amount of tissue required during the surgery – sometimes this conservative approach means that a “revision surgery” will be required to remove more tissue. Continuous Positive Airway Pressure (CPap) may be recommended to treat obstructive sleep apnea. This method will work for some children, by splinting the airway open with blowing air. The child must wear a mask and become accustomed to the machine. Some children will not adapt to wearing a CPap mask, making treatment difficult. In addition, a CPap or BiPap machine is not always successful at treating apnea caused by a physical upper airway obstruction. Children with severe extra-esophageal reflux disease may experience side effects from using a CPap machine, since the machine may blow the reflux into the nasal passages and lungs. On the other hand, sometimes CPap will help prevent acid reflux, by removing the suction effect of the laryngomalacia. Some children with severe GERD and laryngomalacia may have an unsuccessful supraglottoplasty due to uncontrolled acid reflux. In this case, the reflux must be controlled prior to attempting a revision supraglottoplasty. A Nissen fundoplication may be recommended, which is a procedure to tighten the valve at the top of the stomach. Success rates for a Nissen fundoplication for traditional GERD are over 90%. Unfortunately, the success rates of a fundoplication for silent reflux (LPR reflux) are much lower, at around 70-80%. In extremely rare cases, children with severe, complicated medical problems and severe laryngomalacia may have a tracheostomy performed. This is exceptionally rare, as a supraglottoplasty is generally successful at fixing the problems caused by laryngomalacia.